The 138-meter Bloudek giant belonged to home athletes today on the first of two Continental Cup competitions this weekend. 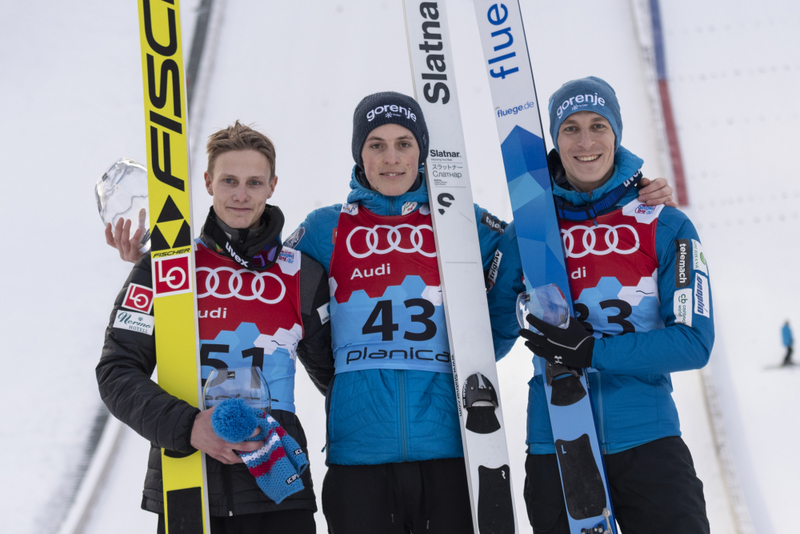 Bor Pavlovčič of the local club Rateče Planica won with jumps of 135.5 and 138.5 meters and 274.4 points, Andreas Granerud Buskum of Norway finished second (265.7 p.) and Jurij Tepeš another representative of Slovenia third (265.4 p.) The COC competition continues tomorrow at 11.00 with the trial round. It’s good that all three jumps were great. I’m happy that I was relaxed and I hope for that also tomorrow. There are some things to improve but lately, when I try to improve on something bigger problems arrive. Tomorrow I’ll try to clear my head and enjoy. I felt really good today, all the way from training, through first and specially in the second round. I made good jumps. Tomorrow I need to improve the telemark. I like it here, it’s my favourite place, it’s beautiful. I’m happy although I still jumped a little tense because I didn’t have good results in the previous competitions. Finally, I made it to the top three again in the Continental Cup, so I’m happy that things are getting better.